This is truly creative cooking with artist Nancy Noël. Published in 2006, this cookbook has healthful, fresh and gourmet-style recipes that Nancy loves. 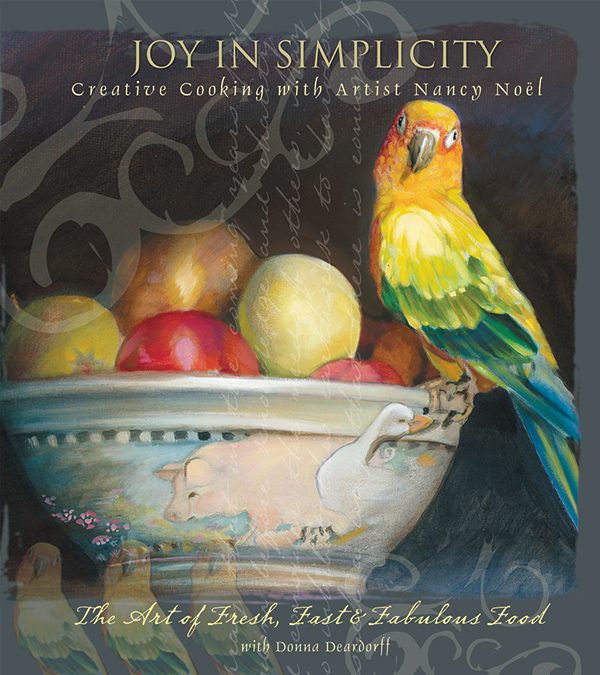 When it comes to cooking, Nancy’s mantra is, “It shouldn’t take longer to make it than it does to eat it.” This cookbook is beautiful and looks lovely sitting in an easel on your kitchen counter! We need to understand that what we do to the earth, the animals, and every living thing is what we do to ourselves. I remember very clearly the day that the effects of the chemical crisis we are now experiencing in our food and water was brought to my attention. It was as if Mother Earth was sending a message to me. I had decided to take a helicopter to Amish Country, a few hours north of Indianapolis. My intention was to paint and study Amish life. About an hour or so out I noticed a distinct change in the fields below. It was as if a line had been drawn. I asked the pilot what was growing below that looked so suddenly different from the fields we had already crossed. He replied, “We are now in Amish Country, and most of their crops are organic.” I was shocked to see the lush, green, healthy appearance of the Amish fields in comparison to the heavily sprayed crops of the typical American farm. Soon after, my art journey took me to Africa. I became aware of the reluctance of the government and the African people to be involved the genetic altering of food, a practice going on in the United States for over 25 years without the knowledge or approval of the consumer. I began to learn about the inherent dangers and long-term devastating effects chemicals have had and will continue to have on our food, water, health, economy and future. This book is my small contribution to a saner way to feed ourselves and the people in our lives.